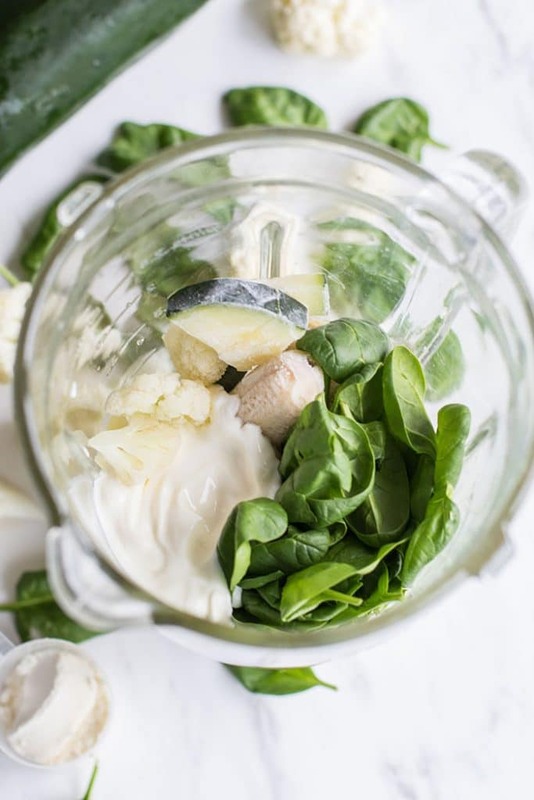 This Peppermint Detox Smoothie is the perfect light meal, packed with veggies, banana, and yogurt, to help you get back on track after overindulging during the holidays. My toddler loves these smoothies, and I love knowing he’s getting a variety of vegetables he might push away if found on his dinner plate. This smoothie has been on repeat in our house the past few months. 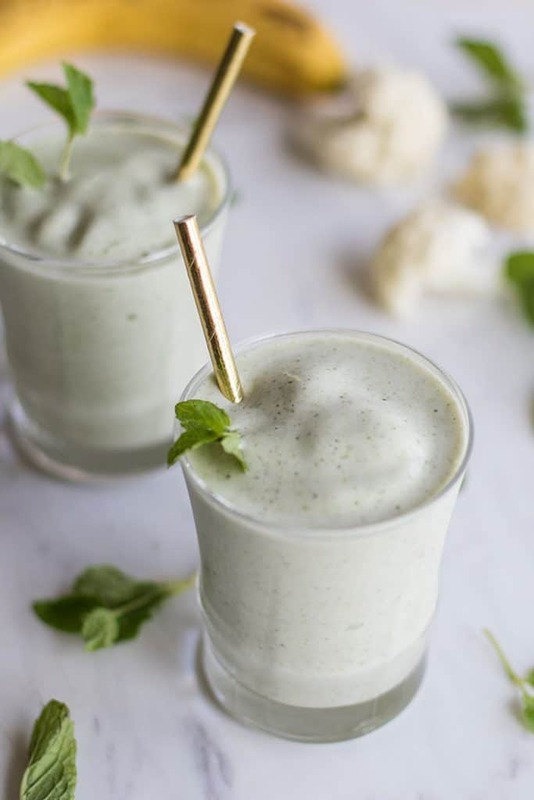 We all love peppermint, and green smoothies have always been a favorite — but when I started seeing cauliflower go into blenders around the web, you know I had to try it! 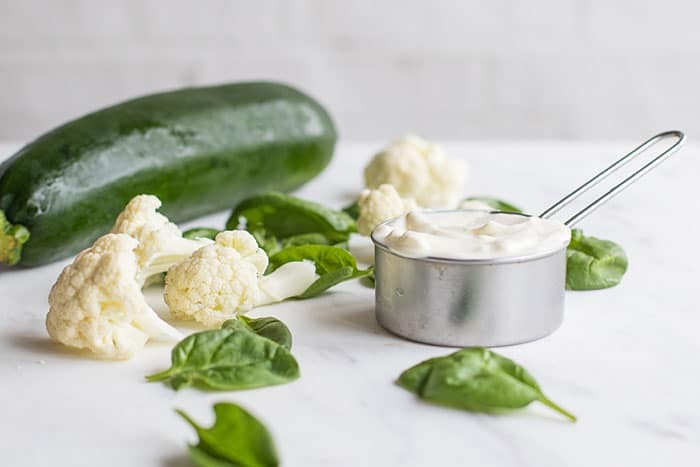 Surprisingly, it blends into drinks just as easily as greens — if you’re trying to add some sneaky vegetables to your kids’ diets, then maybe even more easily. Xander doesn’t mind green drinks, so we still throw in a few green veggies, but some frozen cauliflower is totally undetectable in a smoothie. I buy the unflavored, unsweetened whey, and it has a great flavor that mixes in well to both baked goods and smoothies. I have often felt I should switch to a plant based protein, but I have a lot of food allergies, and I can’t have most of them. Also, most plant based ones do not have a great flavor, so they need to be sweetened, sometimes with stevia, another thing that may be “natural,” but I am severely intolerant to it. Regardless, I want the sweetness of the fruit in my smoothies to come through, not the protein powder. 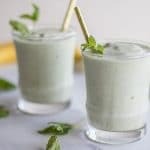 This smoothie is adapted from my Chocolate Chip Mint Smoothie – one of the most popular recipes ever on my blog. We took out the coconut milk and chocolate to make this more of an every day sipper, and threw in more veggies. I have really been enjoying the lightness of this Peppermint Detox Smoothie, and was pretty thrilled to find my toddler would drink one every day right along with me. If you’re unsure if your child will drink this, just watch my son help! In the video, I am showing making this smoothie in a standard blender – nothing fancy, to show that you don’t need a high spend blender to make good veggie smoothies. I’ve added a bit of water along with the yogurt, which helps it get going, and it turns into a thick, smoothie, and creamy drink. If you have a high powered blender, it just makes it faster! I buy frozen spinach cubes that are pressed fresh whole spinach leaves in a cube the size of an ice cube. I prefer to use those in my smoothies because they are so convenient to have on hand, plus they keep my green smoothies extra thick – I am not a fan of thin smoothies. If you can’t find frozen spinach cubes, you can make them by chopping up spinach in a blender with a bit of water, draining the excess water, and filling an ice cube tray with the chopped spinach. Store in a freezer bag for easy use. Make it Dairy Free: Use a good tasting plant-based protein powder, and sub a coconut yogurt. Full fat coconut milk would work in place of the yogurt as well, but I really like the tang the yogurt adds to this Peppermint Detox Smoothie. Coconut milk will make it overall sweeter. This veggie based smoothie is the perfect light breakfast or snack when your body is in need of hydration and tons of veggies - perfect for the holiday season after you've overindulged and want to feel like you're back on track! Kids love this smoothie too - my toddler drinks one every day. I sometimes add a bit of coconut milk or coconut oil to his to add more calories since he is a tiny guy and not a great eater. Start by adding the yogurt and water to the bottom of the blender, and then add the rest of the ingredients on top. If using whey protein, you will see the smoothie starting to "fluff up" after it's fully blended. It makes the smoothie extra creamy and ice-cream like in texture. I absolutely love BioChem Whey Protein — I don’t like to make smoothies without it, especially this Peppermint Detox Smoothie. It adds to much to the texture, in addition to adding an extra pop of high quality protein. It’s one of the best quality protein powders out there – grass fed pure whey isolate and some natural vanilla flavor. That’s it. No fillers, no artificial flavors or sweeteners, nothing to upset your digestive system (especially if yours is sensitive like mine! I do not work with this company, I just really love their product, and I often get asked what protein powder I use– so here it is! It is an affiliate link, meaning if you decide to purchase it, I will get a small portion of the sale, which is part of what helps me keep the blog running! (I’ve also found it’s consistenly the cheapest to buy on Amazon (free shipping with Prime), although occasionally you can buy it for the same price at Whole Foods if it’s on sale). This will be a great additional to my smoothie diet. Especially with the spinach. I love it! Veggies in smoothies is the best!